If you don't have room for a full grill or you just want something that's easily portable, the propane-powered Cuisinart CGG-200 can be quickly and easily set up anywhere. Despite its compact size, it has a 12,000 BTU burner and a 240 square inch enamel-coated cast iron cooking grate. There's an integrated temperature gauge in the lid and dual stainless steel folding side tables add to the convenience. 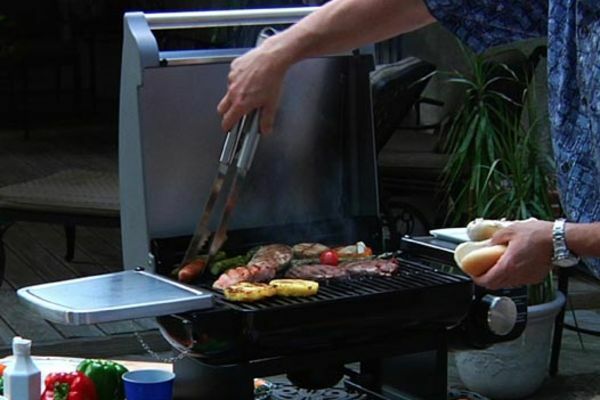 You can pick up the propane tanks at any hardware store, and the there's an optional Cuisinart folding grill stand that turns this compact grill into a more traditional grill for home use without reassembly.